Treating Children with Sexually Abusive Behavior Problems: Guidelines for Child and Parent Intervention is a unique, pioneering venture in the area of sexual abuse. 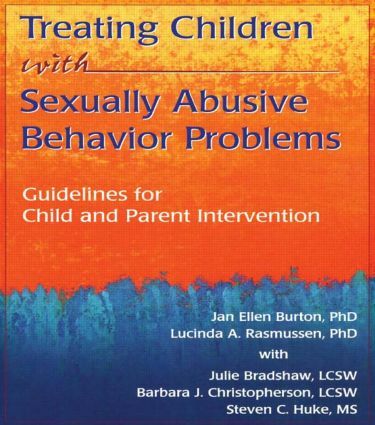 Unlike most books on sexual abuse, which focus on children as victims, this integrated treatment approach suggests ways to develop parallel treatment strategies for both parents and children who display harmful sexual behavior. Treating Children with Sexually Abusive Behavior Problems is intended for professionals in child sexual abuse; graduate and undergraduate students in psychology, social work, marriage and family therapy, and psychiatry; juvenile court workers; child welfare case workers; teachers; attorneys; and judges. It will also serve to better inform the victim, family, and general public. If you’re concerned about the spread of sexually abusive behavior in children, you’ll want to become informed and armed with the practical and useful guidelines found in this innovative approach to a prevalent social problem. How Would You Feel If . . .